On Thursday, September 7, 2017 the Katie Brown Educational Program (KBEP) will host ” Dining to Donate”. The event will take place at Applebee’s, 311 Plymouth Ave, Fall River from 11:00 am to 9:00pm. Dining to Donate is a fundraising program, offered through Applebee’s, that support neighborhood causes. 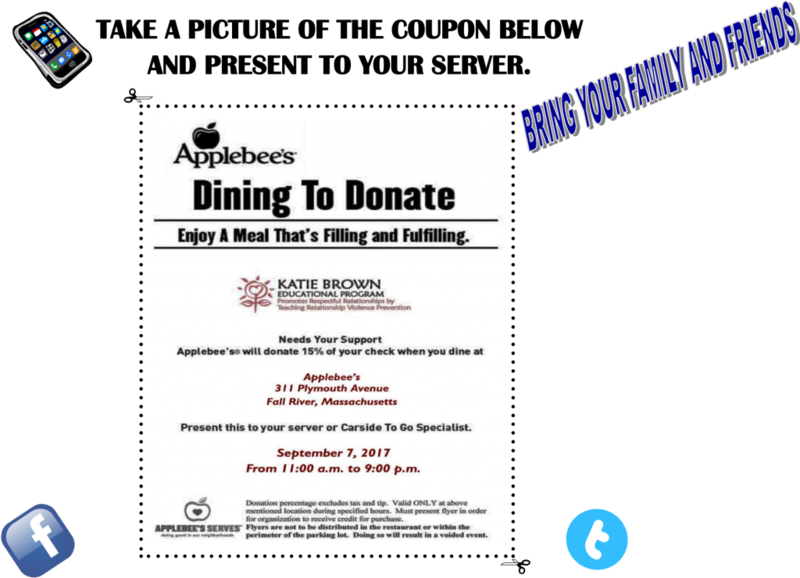 In order to participate in this event, and support the Katie Brown Educational Program, participants must present the flyer below while dining at Applebee’s on September 7, 2017 between the hours of 11:00 a.m. and 9:00p.m. Applebee’s will then donate 10% of each food and beverage purchase (where the flyer was presented*) to KBEP, to aid our attendance and ability to present at the National Conference on Health and Domestic Violence (NCHDV) held in San Francisco, CA. Our primary programming is our classroom education that we offer to students in grades 5 through 12. We also offer summer programming for elementary-aged, middle school-aged, and high school-aged children. Other programs that we offer are professional development trainings for teachers and prevention workers, parent workshops, and trainings for college students through the RSVP Program. For more information on the Katie Brown Educational Program, click here. For more information on the National Conference of Health and Domestic Violence click here. *Flyer may be presented electronically (via smart phone or tablet) in addition to in-print.